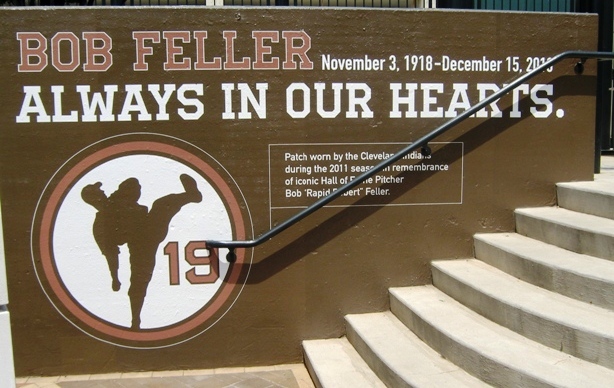 A few years ago, I was approached by a gentleman named Peter Fertig, author of a children’s baseball book called “The Deal Is On Strike Three” (that’s an affiliate link, incidentally), who asked me if I might be willing to serve on the board of the Bob Feller Act of Valor Award that he had founded. I was surprised and more than humbled by the request. I had always admired Feller, but reading more about the man, I am now in awe of him. When I think of players I wish I could have seen in their prime, it’s often pitchers that go near the top of the list. I loved watching Roy Halladay, Justin Verlander or David Price just blow through a lineup and make the best hitters in baseball look like Little Leaguers. One of baseball’s greatest pitchers. And an even greater American hero. So one of my only regrets of being born when I was is missing out on seeing the greatest pitchers; and if you asked me to pick my top three that I never saw, they would be Walter Johnson, Sandy Koufax, and Bob Feller. And maybe Steve Dalkowski, had he ever made it in the bigs. The Indians hadn’t been much of a powerhouse for most of my 45 years. But there was a time when the Cleveland nine were a consistently contending squad, and the biggest reason was Rapid Robert. During Feller’s career, the Indians made two World Series appearances, winning the 1948 Fall Classic against the Milwaukee Braves. They finished first or second for six straight seasons towards the end of Feller’s career. Bob Feller piled up strikeouts in an era when hitters were far more selective than they are today. It’s not that Kerry Wood or Roger Clemens recording 20 Ks in a game isn’t a big deal, but I doubt it was as much of a big deal as Feller fanning 18 in one game, as he did in October of 1938. In 1946, he set a record with 348 strikeouts, which would stand until Nolan Ryan K’d 383 in 1973. He also threw three no-hitters, a record until Sandy Koufax came along, and 12 one-hitters, a record that still stands (shared with Ryan). One of them was the only Opening Day no-hitter in history, in case anyone asks you the trivia question of “when was the only time in history when every player’s batting average was the same before and after a game?”. Another was against the mighty Yankees. Said Feller of that one: “The no-hitter on opening day in Chicago is the one that gets all the attention. 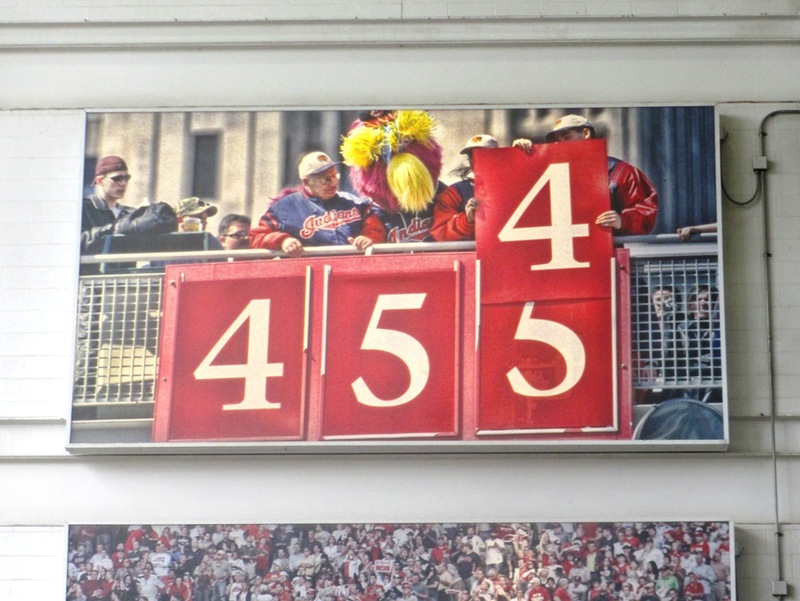 But my no-hitter at Yankee Stadium was against a much better team than the White Sox. There was no comparison. I had to pitch to Tommy Henrich, Charlie Keller and Joe DiMaggio in the ninth inning to get the Yankees out.” What a thriller that must have been to see. The one baseball record that is most unlikely to be broken. Feller posted 266 wins and 2,581 strikeouts in his career. And like many great players of the era, he lost four seasons to World War II. Despite a terminally ill father and the offer of an exemption from combat, Feller enlisted immediately after the bombing of Pearl Harbor, and served as a gun captain on the U.S.S. Alabama, a ship that saw several combat missions. During his time in the Navy, Feller earned six campaign ribbons and eight battle stars. He is still today the only Chief Petty Officer that is in the Baseball Hall of Fame…the one record he owns that is most likely to remain unbroken. 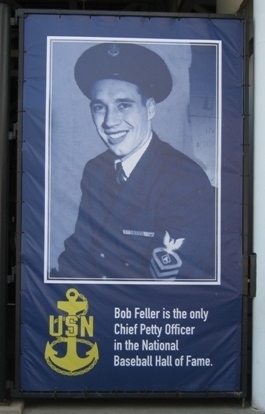 Feller believed that everyone should serve in the military because of its character building. I could never argue with someone who no-hit the Yankees in the Stadium. A windup that says: here comes strike three. 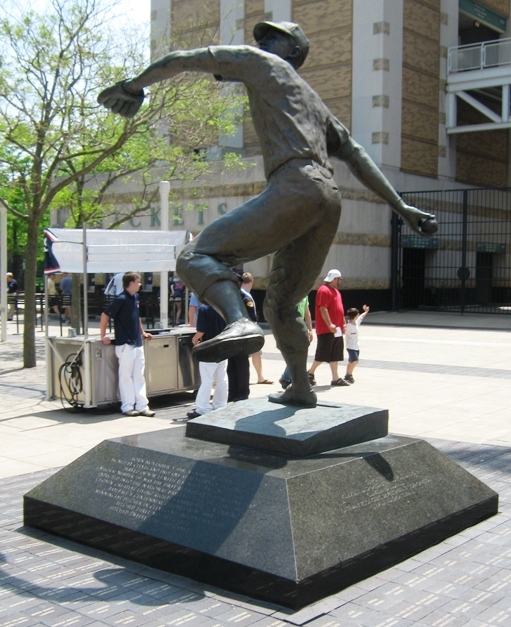 Feller passed away in December of 2010, and while I didn’t think too much of it at the time, I realize now how fortunate I was to have been to a game in Cleveland the following season, and seeing tributes decorate Progressive Field…some of which are featured in this post…and seeing the statue dedicated not just to the Greatest Indian, but much more importantly to a proud war hero. It is a great honor to serve for the Bob Feller Act of Valor Award. I highly recommend that you have a look at the Act of Valor Award website and Facebook page, and see more about what they do to acknowledge war heroes, both of past eras and today.